I'm new to the forum. I would like to ask for your opinions on an item I recently acquired. It's a game from Japan from late 1993 or early 1994. It was never released, not in Japan nor elsewhere. The game was cancelled because Michael Jackson was having a lot of trouble with those allegations at the time. Supposedly it was bad publicity for Sega and they cancelled the game plain and simple. The history I gathered about this project is that it is an extension of a SEGA arcade game that was released in 1992 or 1993, called AS1 Simulator. A bunch of players would sit in a big spaceship simulator and would fly the spacecraft and fight aliens. The cockpit would move around like a real simulator. Jackson was the instructor and people would see him talk to them on the screen and give them instructions. That game quickly disappeared from game rooms and Sega parks because of the scandal surrounding Jackson at the time. But the original plan was to expand that concept and collaboration to a regular video game for the SEGA Genesis console. It all went down the drain because of the scandal. However, the game was actually produced by Sega and was ready for release when it happened. The copy I have is still sealed. Still, the person I got it from has a copy and played it. It's a regular flight simulator, with combat, aimed at children, so quite easy. Jackson doesn't sing in the game, he only gives you instructions. So, having said all that, my question is, what would be the value of such an item ? Do you have a scan of the rear? Cool story! Is there a video of this on YouTube? It's a bit of an odd one this. I'd never heard of the game until your post and there seems to be conflicting info online. 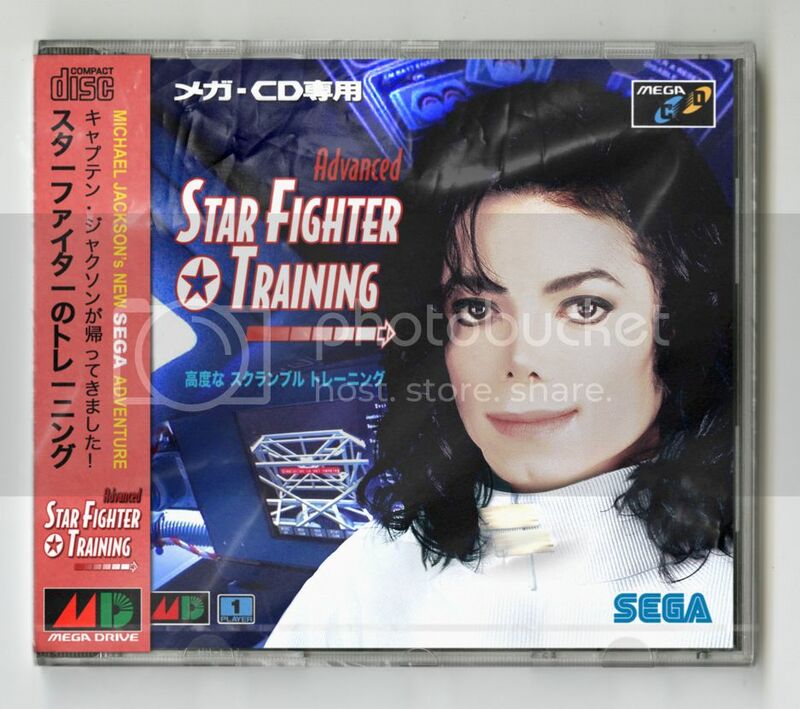 The arcade game was called 'Michael Jackson in Scramble Training' and it's not really a game, it's was a ride similar to those Star Trek shuttle looking rides that play a video of a rollercoaster going through a volcano or something while the entire 'shuttle' is jerked around on some sort of hydraulics. http://www.mjtunes.com/modules/xoopstube/singlevideo.php?cid=81&lid=968 Video of the 'ride'. The 1-8 'players' is the amount of seats in the ride. The video does suggest through MJ's language that there was some sort of interactivity but all sources point to the SEGA AS-1 as being a ride and not an arcade machine. FAKE. It is a cynical photo shopping of MJ into something made to resemble a game. There's also the question of what is on the disk, if there is genuine code of a previously unheard of and unreleased Mega CD game in a playable (or as you put it 'completed') state this would be the find of the past 5 years. The problem is that because you're a new member you have no reputation, you've stated that the game is 'sealed' and you're asking about value, I bet you're not willing to open it up to prove whether or not this is a scam. Wow, Moleman, way to make me feel welcome ! But I understand where you're coming from. You've never heard of this, so you're suspicious. Michael Jackson would say it's "human nature". The thing is I'm not a gamer and English isn't even my first language, so when I described the game AS1 as an "arcade" game, that only shows my limited knowledge of adequate vocabulary in this field. I shouldn't have said "arcade game", I should have said "ride". Because that seems to be the appropriate word. But obviously, we're talking about the same thing : the AS1 was indeed a big thing that moved with people in it and some kind of interaction. I can scan the back of the CD, no problem. However, I would like to avoid opening the plastic wrap unless absolutely necessary. Is that really suspicious ? Collectors do value a pristine item that is sealed. Besides, would a picture of the disc really be any proof that this is real? If I was able to Photoshop the box with such realism, I bet I would be able to photoshop the CD inside just as easily, wouldn't I ? Anyway, since I posted this, I've had some offers, so now I got an idea about value. Perhaps go to your friend and get some gameplay footage? That would be very interesting to see. Isn't that photo too new? Maybe it's me. Also, where is his name? Shouldn't it still be in English? Yakata wrote: Wow, Moleman, way to make me feel welcome ! Apologies if i come across as being hostile, it's not my intention. Unfortunately this hobby is filled with scammers and so my questions, no matter how 'unwelcoming' they may be, they really must be answered. There is a market for sealed games yes, but there's a futility to it and it's full of pitfalls. Like any sealed item you don't actually know what's inside, it's a crazy niche in the market where you're trading on the perceived value of an item without actually knowing to the full extent what you have. Imagine this type of trading on other markets, merchants trading sealed chests of gold that cannot be opened for reasons pertaining to value. Only, one merchant decides to open a box and discovers it's full of rocks, it's crazy but this is comparable to the sealed retro game trade. The seals on games nowadays are easily faked. Your item doesn't fit into a normal sealed game trade as any perspective buyer, if they have 2 brain cells to rub together will be suspicious. Taking pictures of the box will only get us so far, same with the disc. Really, you need a video of the item running on a console, which will mean opening it up. If anyone disagrees with me now is the time to chime in. Opening it up imho wont effect value unless you're trying to scam. Sealed, the item will always generate suspicion. Opened and proved to be real it will be a serious high ticket collectors item. This site has a great community with users from all around the world, I'm sure members who are in your country would jump at the opportunity to help you and prove the existence of a Mega CD game. How did you come across this item? He said the guy he got it from has one that plays, so I'd absolutely get footage of that to prove it is real. Yours will be worth more if you can get proof of it being real. T Moleman wrote: It's a bit of an odd one this. I'd never heard of the game until your post and there seems to be conflicting info online. jesus christ and I wonder why I even come to these forums once a month or less!!!!! Why does this jealousy thing ALWAYS get thrown around? Why? It is the lowest denominator, an ad hominem fallacy that ALWAYS, ALWAYS comes up on these boards. Rather than actually applying some critical thinking to what I’ve written you dismiss it as jealousy? No, I am not jealous. No, I do not want someone to open up a ‘one of a kind’ item just for me. In fact, by virtue of the OP’s friend having a copy would prove that this is not one of a kind. But… even if it was one of a kind you wouldn’t actually know that until you opened it and found out what was inside. You see, having opened ‘Brand new sealed’ GC games and found them with missing/wrong instruction manuals and dirty, scratched games I know from experience that unless you open a game you don’t know what’s inside a sealed box. What I would like is some proof that this an actual game. Where did it come from? I’m not asking for personal contact details but rather a credible story of how it came to be in their hands. Unfortunately the times we live in now are full of hoaxes, scammers and everyone else who is prepared to go to lengths to make a quick buck. Go to eBay and it’s very much a case of ‘buyer beware’, why wouldn’t you use the same precautions here? With the OP’s question “How much is this worth” one would assume he’s trying to flog it. I’m not accusing the OP as being a scammer, but as things stand you cannot seriously take one photo of an unheard of game’s box as proof. There is literally nothing online about this game. I’m not saying that the OP being genuine is not possible, just look at the case of Les Schtroumpfs Autour Du Monde and other ‘found’ games. What I’m saying is that, at least from my point of view, it is the onus is on the OP to prove that his item is genuine, put it in a machine and play it, provide more pictures... I sincerely hope that he comes back with proof and there’s another found game to add to the list. But until then, Buyer Beware. I hope it is real OP would it be possible to see back cover and spine? I'm curious for barcode / serial infos. I searched a little in Google.jp too. There's a lot of pics with MJ and the simulator etc. Who knows. I am keeping an open mind. Supporting my good friend NukoNuko - check out his stuff! I agree with Moleman. You really don't know what is inside. I have bought many sealed games and opened one of them because there was a slight flaw with the artwork (where it had been scuffed on the corner). Everyone had told me it was probably a fake + I had another copy so decided to open it. When I did it was 100% genuinely new!!. I am very sure though that people do fake seals and put nothing but fake worthless games inside for their own greed. This item is from Japan, so I don't know enough about those types of games. but without more photos/videos + proof I wouldn't go near it!. Again why not just ask the die hard Japanese collectors who will have vast more knowledge than most of us on this site. I think the whole situation is dodgy and the people that have 'made the offers already' be very careful. I didn't mean to cause such a debate ! When I asked for value, it was because I have very little knowledge of video games and I was wondering whether this item would be more worthy to a game collector or to a Jackson collector. I am a Jackson collector myself and I was curious about the reaction such an item would get from game collectors. But I never expected anyone to buy it just after seeing a picture like that. Actually, I'm not even sure I would ever sell this. As for the seal, it may be different with gamers, but with record collectors, it does make a big difference in value if the original japanese seal (and obi strip) is in place and intact. So on the one hand I would like to see the inside, booklet and CD, but I think some other copies of this game will probably turn up in the near future. Then, we'll have all the pictures of the inside and possibly someone with more technical aptitudes than me (i don't own a Sega console by the way) will put a video of the game on youtube. If and when that happens, I'll be happy I haven't opened my game and kept it pristine ! Anyway, thanks for the feedback. It showed me that gamers are interested too (maybe less than Jackson fans, though) ! Couldn't you at least go back to your friend and record some footage with your cell phone? I want this to be real because it has the greatest title of any game EVER. I'm sure this was a simulator ride in Sega World in London in the early 90s? I remember going on it back in the day. Spoke to my Japanese friend, he said the text is poorly written Japanese and is probably made by Chinese. Appears it is a fake. shovelthumb wrote: Spoke to my Japanese friend, he said the text is poorly written Japanese and is probably made by Chinese. Appears it is a fake. aha there you go guys and girls. Just another fake copy! !